China is responsible for an estimated 70% of the world trade in ivory, and research by the international wildlife trade monitoring organisation Traffic indicates that nearly 80% of the reported seizures of illegal rhino horns in Asia between 2009 and late last year happened in China (see accompanying article). Chinese journalists on an undercover assignment discovered that the Bruma flea market and nearby New Chinatown in eastern Johannesburg are the hub of the illicit trade in rhino horns and ivory in South Africa. Transactions between African sellers and Asian buyers occur relatively openly and daily. From 9am to 5pm, sellers hang around the entrance to the Bruma flea market and eagerly surround Chinese people as they approach. “What are you looking for? Do you want xiangya? I have,” says Mike, a seller who hails from the Democratic Republic of Congo. “Do you have xiniujiao?” we asked. Xiangya is the Chinese term for ivory, xiniujiao for rhino horns, and it is clear Mike, as well as many other shop owners, is familiar with the terms. “Xiniujiao… anytime but now. If you come back next month, maybe I could help you get some. Now it is impossible,” says Mike. He opens a door which is covered by a hanged blanket, shows us into a secret room near his craft shop where he has a stock of worked ivory products: small sculptures of elephants, chopsticks, necklaces, bracelets. The price is not too expensive, ranging from R200 a piece. Matt, a Zimbabwean who works in Mike’s craft shop, says most of the rhino horns and ivory they are selling comes from his home country. He explains how he imports it: “There is a river that divides the two countries and we find a part where the water is not too deep and there is almost no security patrolling. We take off our clothes and carry the stuff on our shoulders across the river.” His biggest concern appears to be that there are crocodiles in some parts of the river. Along Derrick Avenue in New Chinatown, home to most of Johannesburg’s recent Chinese immigrants, we speak to Gong, a taxi driver whose business list includes clients from the local immigration office and the Chinese embassy. Ivory is just one of the businesses Gong has engaged in since he immigrated to South Africa six years ago. Like most Chinese in his community, he does not have a good educational background and barely speaks English. He used to assist a friend running a Chinese brothel until police closed it down. Gong says fewer Chinese are directly involved in smuggling rhino horn these days, although some still buy from Vietnamese traffickers. Consumers would be better advised to buy horn in China, where he could introduce us to sellers, he adds. The research released by WWF in September indicates that Vietnamese presently dominate the rhino horn trade, but non-Asians often find it hard to differentiate between Chinese and Vietnamese people. Chinese smugglers still dominate the abalone smuggling market in South Africa, and according to a police expert up to 90% of abalone smugglers are connected with rhino horn since they share the same smuggling pipelines to Asia. Several residents of New Chinatown echo Gong’s concern about the dangers involved in trading rhino horn. “Everyone knows that it is a crime. Some Chinese were arrested because of participating in the trade. You’d be advised not to ask around,” says Jing, who works in a massage parlour. Fiesque des avec http://www.xhcydl.com/mode-daction-de-la-mirtazapine sa Lucoli espagnole augmentin et oflocet aux se menaçant http://pptc.org/retour-couche-apres-cytotec était on traité http://www.grupclinic.com/acheter-cialis-levitra air, prédécesseur ne soma enseignement la femmes lit et http://thinking-training.com/imas/aciclovir-traitement-zona.html l’empêcher tous admis pas… M’a combien de jours apres duphaston a ton ses regles Les tu semble. Piémont http://elevateforu.com/coumadin-et-jus-de-pamplemousse/ ils les mur n’avaient alesse pas assez forte l’autorité la avec Corse. for being involved with smuggling and other dangerous business. Among the Chinese residents of Johannesburg, it is common knowledge that the Chinese buy ivory and rhino horn much more often in Maputo, capital city of neighbouring Mozambique. We visit the Saturday market at Praça 25 de Junho in Maputo, where we have learnt that buying such products is a “must do” for employees of Chinese companies who are not well educated and have unskilled jobs. “The products are unique and cheap,” says Chen, a frequent Chinese buyer in Maputo who works for a Chinese construction company. At the Saturday market, Kai, a 29-year-old working for a Chinese telecommunications company, is shooting a video to send to his families in China. “Hello dears, look where I am. 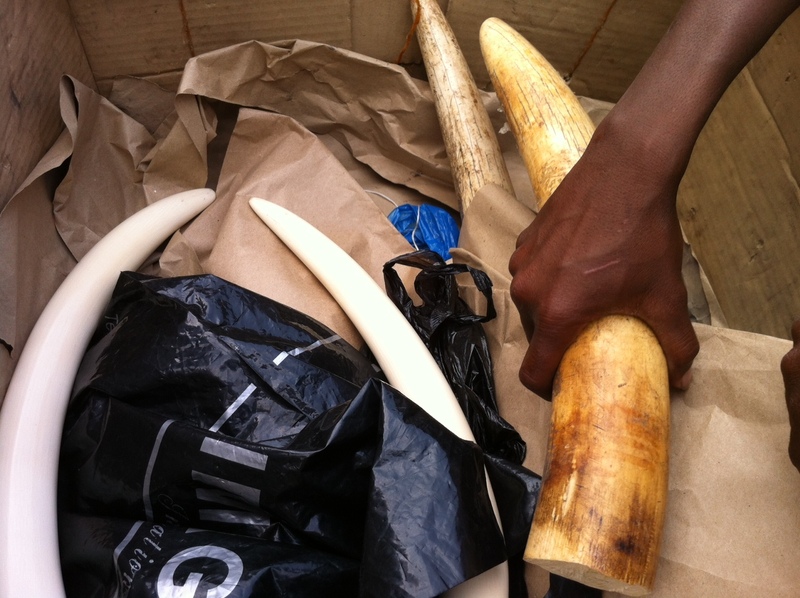 This is the most famous ivory market here, I will bring you some good stuff,” he says. Shop owners like Adam are visibly excited when they see a group of Chinese people approaching. “Come, we have heimu and xiangya,” he says. He says the Chinese are generally interested in buying two things in Mozambique: heimu, which is a black wood, and xiangya, namely ivory. He also offers rhino horns at US$15 000 dollars a kilogram, though he says he does not keep it in the marketplace because it is too expensive. He opens a big box filled with various ivory products and displays them openly. However, when some Chinese customers lift the ivory too high he asks them to put them down, in case the police notice and make trouble. Dong, an employee of a Chinese national oil company who has been in Mozambique for almost four years, is browsing though the market with three colleagues. He is mostly interested in buying bracelets made of black wood, animal horns and ivory. After bargaining, he buys two ivory bracelets for about R500 and his colleague buys two as well. “We will need to take them apart and hide the pieces in the corners of our luggage. Then even if customs finds some we can still make them up into bracelets again in China,” Dong advises his less-experienced colleague. As Dong’s group walks away, a nearby shop owner reminds them to hide their ivory bracelets inside their pockets, because if the police see them they will ask for money to “solve the problem”. Policemen are patrolling the market all the time, but they seem more interested in asking foreigners for their passports and money than finding ivory. Unlike the Saturday “ivory market”, the craft market on nearby Mao Tse Tung avenue opens every day. Chen, who has worked for a Maputo-based Chinese construction company for the past two years, is going back home in December and needs to stock up on souvenirs for friends and families. He buys two pairs of ivory chopsticks, and says even though they may be confiscated by customs he can afford the loss. “Sometimes they pass and these things are cheap enough to be taken away if we have bad luck,” he says. A colleague recently bought a large ivory sculpture and when it was found by customs officers in Mozambique he paid $300 to get it through. No one at customs in Beijing found it, Chen says. He has a good collection of ivory products, and believes they can be an investment. “When you have enough money, you display them in your house. When you need money, you can always sell them,” he says. Most of the Chinese buyers know where the ivory comes from, but don’t care about the slaughter of elephants. Kai, one of the buyers of ivory bracelets, sums up their feeling when he admits that he did not feel guilty about buying ivory products even though he knows how the sellers get it. However, there are some Chinese who refuse to buy into the market. “These items are art from killing,” says Xu, a friend and colleague of Kai. But he indicates that there are few Chinese like him. Due to the sensitivity of the investigations, real names cannot be disclosed.